Before starting this workout, get a thorough warm-up. Start by rotating your joints from the neck down to the ankles. Then do some light jogging, jumproping or similar cardio activity to get the body heat up. To do this workout, all you need is a pair of adjustable dumbbells (or access to a nice db rack.) If possible, choose a weight that allows you to do all 3 exercises without stopping to change the weight. Here is the workout. Perform all 3 exercises back-to-back with no rest in between. After each cluster, rest 1-2 minutes. As soon as you are ready, jump into the next round. Do 3-5 rounds depending on your fitness level. Get into a hip bridge on the floor with the dumbbells held tight to your chest. 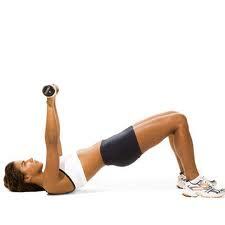 Press the dumbbells in a straight line while keeping the glutes tight and the heels pressed into the floor. Don’t let the hips sag when you lower the weight. Do 20 repetitions. Keep a dumbbell exercise chart on the wall for quick reference. Click here for more. The scene is a bit unusual, even with a preponderance of boot camps scattered throughout the park on any given morning: Four guys, ranging from their early thirties to late forties, gathered at the sand volleyball courts, now dubbed “the sandpit,” barefoot and shivering in the first light of dawn. Several pairs of dumbbells and kettlebells are set on the grass next to the ‘pit, and as I explain today’s workout to the guys, the looks I get range from skepticism to disbelief. They’d been through some interesting workouts with me before, the sand bag relays, various crawling down and back the length of the soccer field, but in order to get them to go barefoot in the freezing sand carrying heavy weights, I needed to be a little more convincing. In the interest of full disclosure, I pulled the term ‘void’ from some Eric Van Lustbader ninja novel years ago, but it stuck with me. The void can be defined as an empty point of focus, or mind-no-mind, the space between spaces. It is reached by finding a point of focus and then finding the space between your eyes and that point, and it is maintained by mindful breathing. The point of maintaining this focus is to take one’s mind away from the pain. As I began this workout I realized that strengthening one’s mind should be a part of a good fitness routine, or at least a side effect. So why not design activities to emphasize that training? This is not a new tactic; the U.S. Military is famous for testing wills after they’re broken down with physical activity. Going to the top of this pyramid and beginning the lap with 50lb. dumbbells became the sticking point. Sure, after this the weight started getting lighter, but only after this. A lap when your arms, shoulders, wrists, calves, maybe lower back, are already tired Hold them at my sides, rest in a squat, push them up overhead, rest again, hold on with everything you’ve got, even though your wrists want to give out…whew! Finally the lap is complete, but it never gets any easier after that, until I’m back down to the 10’s. In the beginning of this routine, focusing on the void was the hardest part. After all, I was only carrying 2.5# plates to start, and I was walking, not running through the sand. However, as the weight climbed to 15, 25, 35 lbs., my feet became numb, and the sand and tree debris scattered over it became painful, maintaining my focus on the void was the only way to complete the workout. Standing there explaining what I wanted to put the group through that day, I’m sure it helped that I could look them in the eye and tell them that I’d done it. Maybe getting frozen feet didn’t bother them, maybe nobody wanted to be the coward, but everyone went barefoot that day, and everyone completed the workout, even if they did have stop a few times to rest.